In 1984 I was interested in changing our police shoulder flashes to better reflect the diversity of community and area. 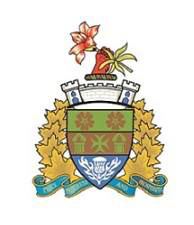 The Saskatchewan Police Commission had developed a "generic" shoulder flash depicting the Provincial Coat of Arms with individual town names across the top. Around that time, a government "Heritage Grant" became available offering municipalities grant funds for heritage related projects. I wrote Her Majesty The Queen to obtain information on being granted armorial bearings for the Town of Dalmeny. My correspondence was directed to the Lord Lyon, King of Arms. All further correspondence was with him regarding the issuance of armorial bearings for Dalmeny. One of the initial steps was to prepare "Letters Patent" which are basically the same as preparing legal documentation to create a corporation. This meant I had to learn the history of the name of the community and provide a comprehensive background relating community history. I thought the best place to start would be Canadian National Railway in Montreal at the Archives Office. Dalmeny was a "whistle stop" for passenger and freight steamers heading to or coming from Edmonton along the secondary main line that ran through Saskatoon. According to the CNR Archives the first railway Station Agent posted here was from Dalmeny in Scotland. Hence the name. The agent was the the person instrumental in having the "whistle stop" named "Dalmeny." The Coat of Arms, legally referred to as the Armourial Bearings for the Town of Dalmeny in the province of Saskatchewan are in essence the "Corporate Seal" of our municipality. The Lord Lyon, King of Arms granted the crest as the Armourial Bearings on the authority of Her Majesty the Queen. The Coat of Arms can only be used by the Town of Dalmeny and are protected from being copied - by law. "A lion's gamb Gules grasping a prairie lily slipped and leaved Proper. The coronet Argent, embattled and of two towers all Argent, port and windows Azure. Per fess Vert and Azure, on a fess Or between two primroses of the Last in chief and a thistle slipped Argent in base, a cross anchoree between two garbs of the First." The Crest is the red lion's paw grasping the prairie lily of Saskatchewan. The coronet, or castle symbolically represents a Canadian Township (municipality). The two gold primroses at the top of the shield are taken from the Earl of Rosebery whose surname is Primrose and who is also entitled to the Lordship of Dalmeny in the peerage of Scotland. The centre portion of the shield with the gold background contains the green cross anchoree between two green garbs or sheaves. The cross anchoree is symbolic of the Christian Mennonite tradition in Dalmeny and the two green garbs allude to the grain growing activities of the district. In base, the silver thistle on the blue background alludes to the element that have come to the township (municipality) from the United Kingdom. The Arms are emanating from the Scottish authority therefore the silver thistle of Scotland is placed on a blue background echoing the colours of the St. Andrew's Cross, that is a silver cross on a blue field.